When I was a kid growing up, we always ate dinner together as a family. When we lived close to my grandparents, Sunday dinner was always at their house with all of my aunts, uncles and cousins. From time to time, one of my grandmother’s sibling might make an appearance. My cousins and I would play outside from the time we got to their house all the way up until grandma yelled out the back door for us kids to come in because it was dinnertime …. I think that’s the only part of the day where we slowed down! The cousins all sat at the “kids table” and we talked about all the fun we had that day and all the things we still wanted to do before we had to come in to get cleaned up for bedtime! After dinner we would be right back outside again. I have so many fond memories of those times. And to be frankly honest with y’all, I kinda miss those days. While most of our family is spread out across the country now, it’s not as easy to get together like we used to. With today’s schedules and family dynamics, it’s often difficult for family’s to sit down together and enjoy a meal. Not to mention, someone has to plan it and cook it! 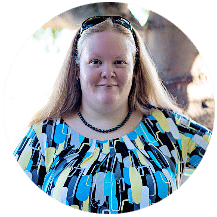 Between work, sports, school … and just life in general, we’ve got a million and one things vying for our time and sometimes, it’s a real struggle to balance it all and make time. While I might not be able to have Sunday dinner with my kiddos like we had at my grandma’s, I can still make those memories and encourage my children to carry on traditions into the future. My grandma was a great cook. Aren’t all grandmas?! Although what she made wasn’t fancy, it was comforting. 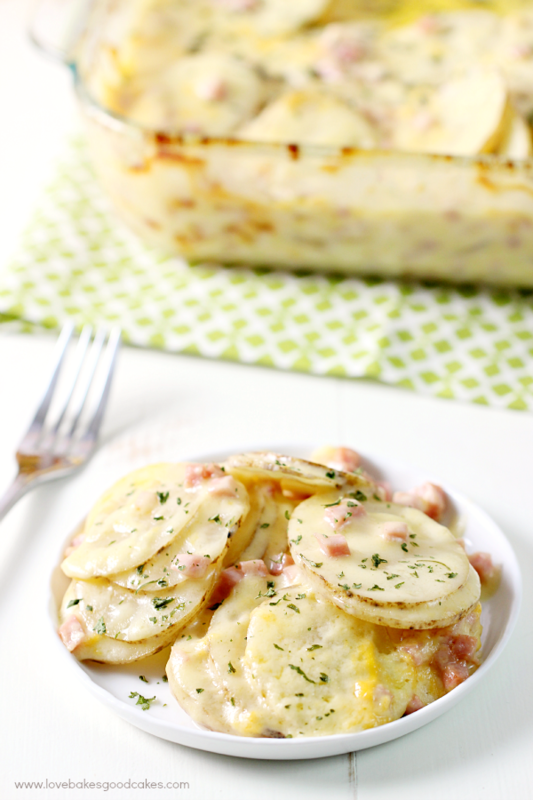 There are several dishes she made that I loved – and one of them was Scalloped Potatoes with Ham. Like many grandmas, she never used a recipe. She could make enough food to feed an army and make it all seem so effortless. For Sunday dinner in the Love Bakes Good Cakes house, I usually try to make something that reminds me of those Sunday dinners growing up. A part of me hopes to hold onto those memories from my childhood while sharing those experiences and food with my kids today. In turn, I hope some day they will look back with the same affection and will share it with their own children. Maybe I’ll even be blessed enough to have my own grandkids over for Sunday dinner some day. 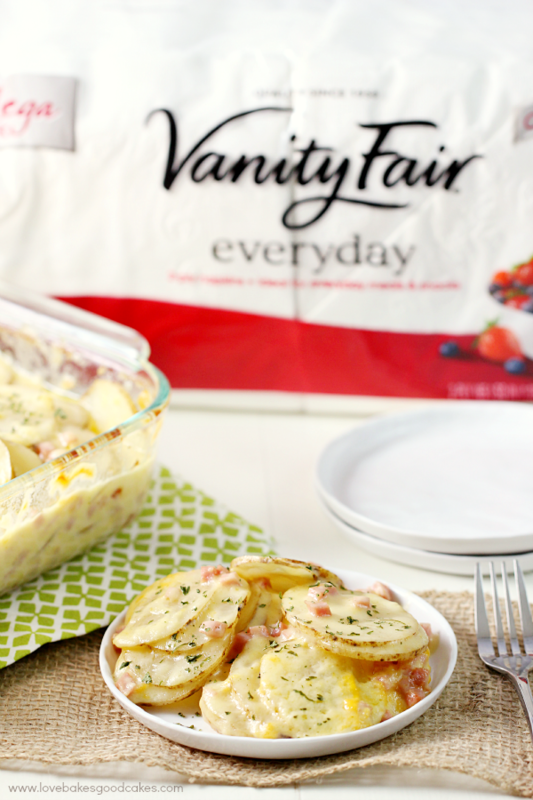 Vanity Fair® Napkins understands the importance of spending mealtime together as a family. They have launched a campaign – #TakeBackTheTable – encouraging families just like yours and mine to take back the table. My family took the pledge to eat at the dinner table more often because I want my children to know how important this time together is and I want them to have memories like I had as a kid. 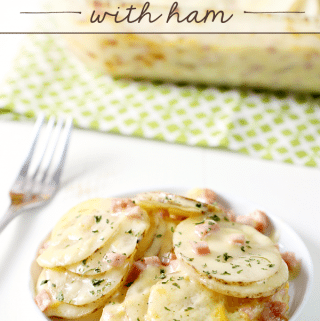 With comfort food like this Cheesy Scalloped Potatoes with Ham recipe, it was easy to bring everyone to the table! 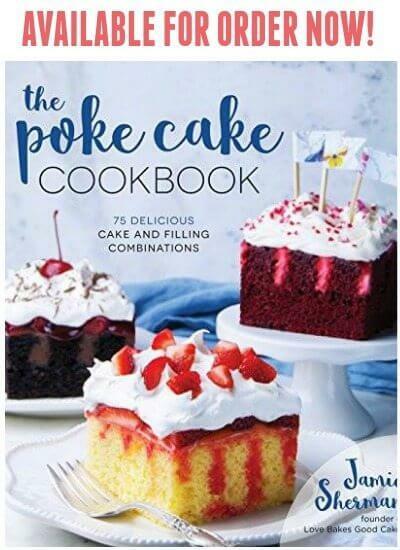 We challenged all Love Bakes Good Cakes readers to take the pledge too! You can take back the table by pledging to eat at the table more often and I encourage you to challenge your friends and family to join us! 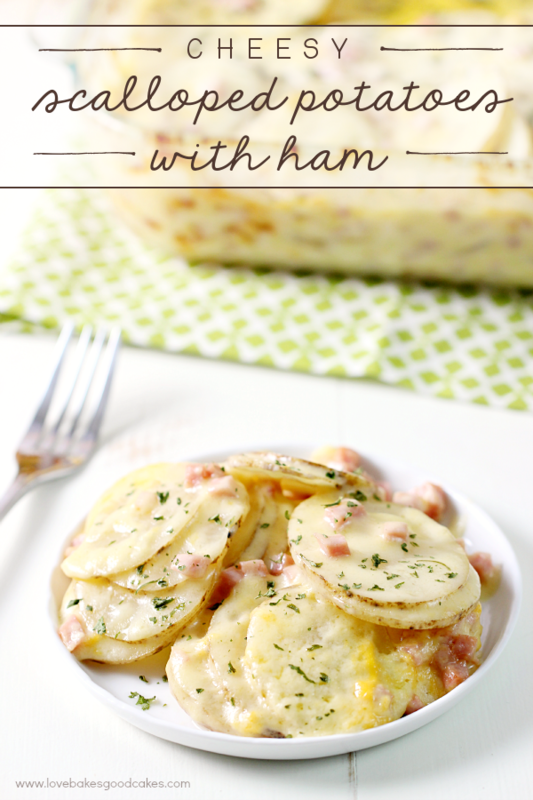 This Cheesy Scalloped Potatoes with Ham recipe is just like grandma used to make! 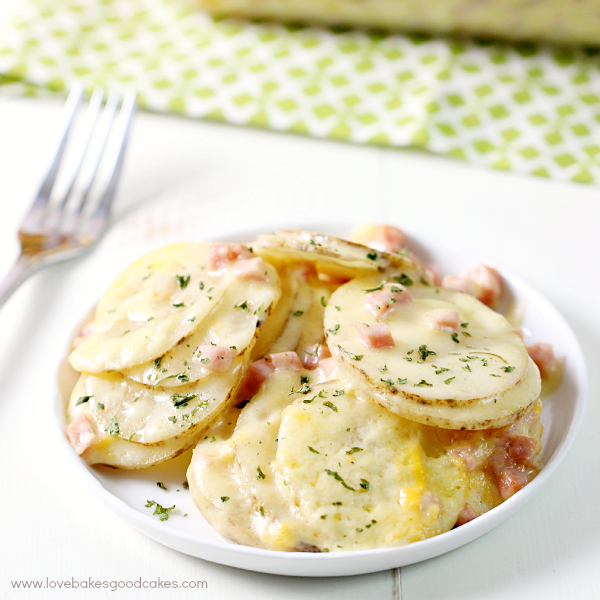 Simple and delicious comfort food! Preheat oven to 350°F. Spray an 8x8-inch or 9x9-inch baking dish with cooking spray and set aside. In a medium saucepan, melt the butter over medium heat. Whisk in the flour until smooth. Gradually add the milk, whisking constantly until thickened. 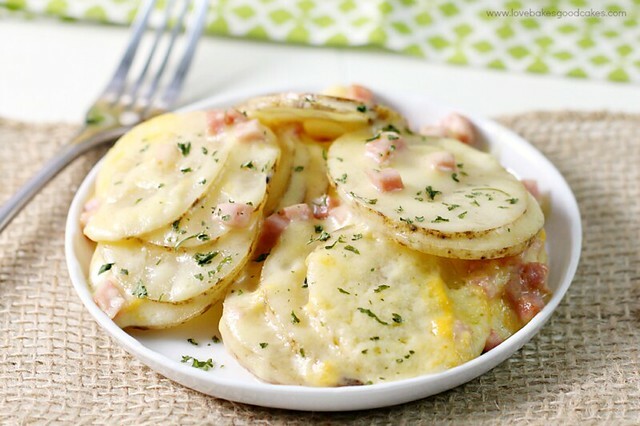 Remove from heat and stir in cheese until melted. Layer half of the potatoes in the prepared baking dish followed by half of the ham. 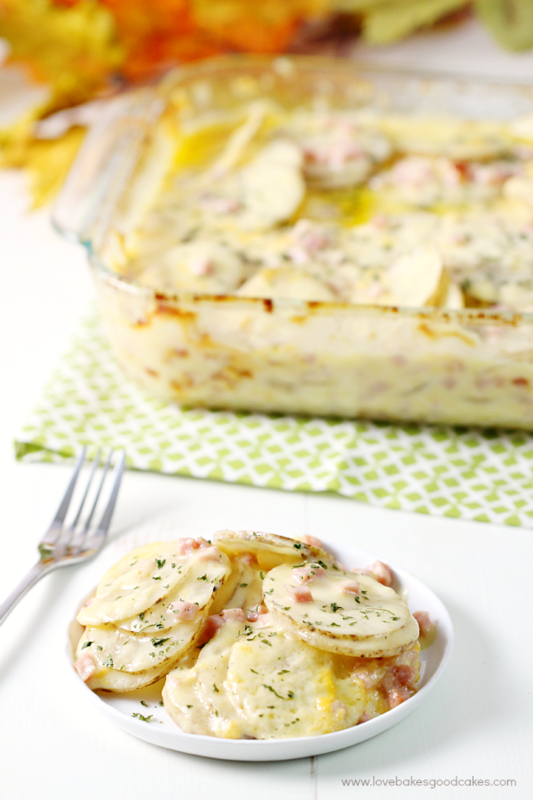 Spoon half of the cheese sauce evenly over the ham and potatoes in the baking dish. Repeat layers. 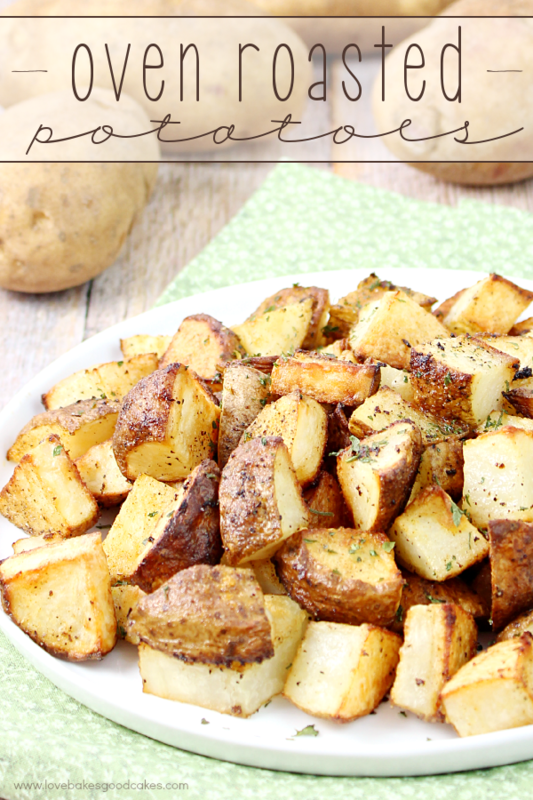 Bake in preheated oven for 60 minutes or until the sauce is bubbly and the potatoes are cooked through. 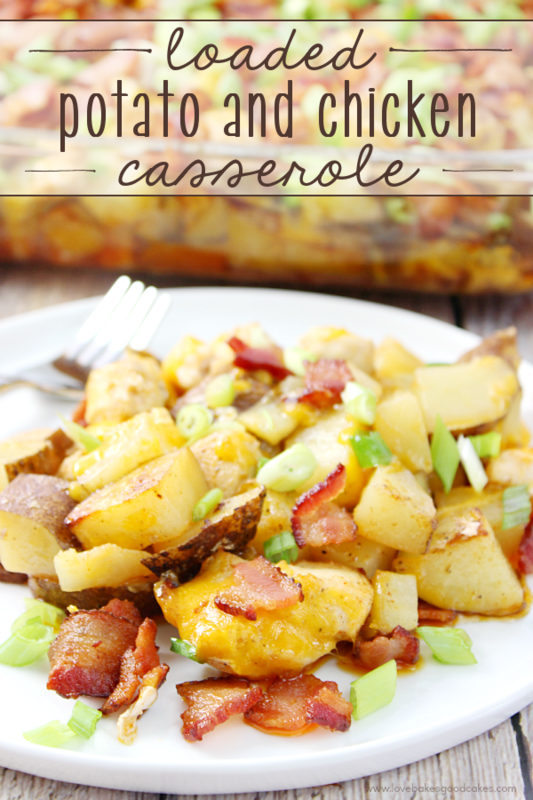 This recipe looks good and easy to make. Going to try it very soon.